Is Your Company Ready for Its Future In the Cloud? Did you know that 82% of all companies are already using some form of the cloud? Not only that, but companies that use cloud technologies experience a 51% higher growth rate than companies that don't. The reason for this growth can be attributed to all the benefits of moving to the cloud: cost savings, completing tasks faster, and a better allocation of IT resources, just to name a few. So what's the reason for companies not moving to the cloud? Well first off, it's not easy. You must consider factors like time, cost, security, and employee satisfaction. At the end of the day, most executives feel they just won't accomplish their desired ROI, which may be true without an effective change management program. Change management is pivotal to a successful IT project, whatever it may be. 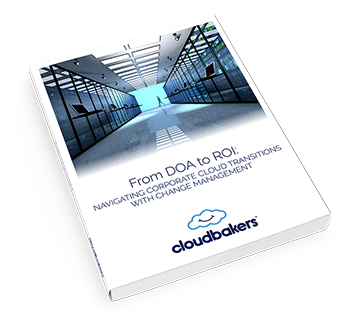 Download our eBook to better understand how to create an effective Change Management process.